The Tirfor 500 series of cable pullers are perfect for medium duty lifting, pulling and tensioning applications. The cable pullers in the Tirfor 500 series are suitable for medium duty applications. They can be used for lifting, lowering, pulling and tensioning tasks with forces not exceeding the working load limit of the machine chosen. There are 3 models in the Tirfor 500 series range, the Tirfor 508, Tirfor 516 and the Tirfor 532, with top working load limits of 600kg, 1600kg & 3200kg respectively. 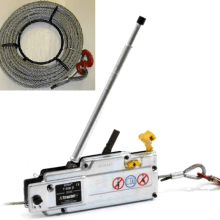 All available from Lifting Hoists Direct, your one stop shop for all hoisting equipment, contact us for a quick quote. 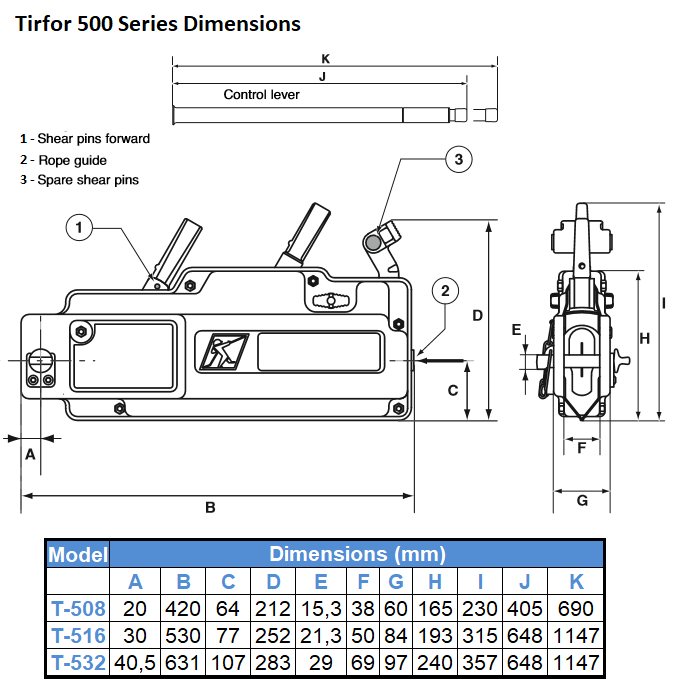 The Tirfor 500 series machines are an easy to handle device, being compact and lightweight. If easy portability is high on your criteria list then these machines will fit the bill with the Tirfor 508 weighing 6.6kg, though this is without the handle and 20 metres of wire rope, adding these to the weight will make the 508 weigh a total of 13.7kg, the total combined weight of the Tirfor 516 is 28.9kg (machine only = 13.5kg) and the Tirfor 532 is 52.9kg (machine only = 24kg). The Tirfor 500 series is NOT suitable for man-riding applications; if you need this option then the Tirfor TU range will be the best option. 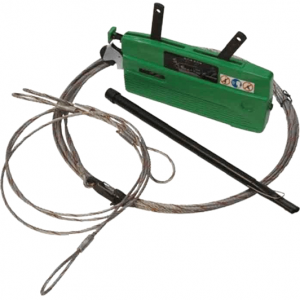 These cable pulling machines are easy to use by simply placing the separate telescopic handle onto either the forward or reverse lever, depending on which direction you wish to pull the rope through; then it is simply a case of cranking the handle back and forth to operate the internal jaws and pull the wire rope through. The action of the cable puller enables very precise placement of the load. It is imperative that the Tirfor machine is correctly anchored to ensure safety in use, failure to follow the recommended guidelines may result in a serious accident. 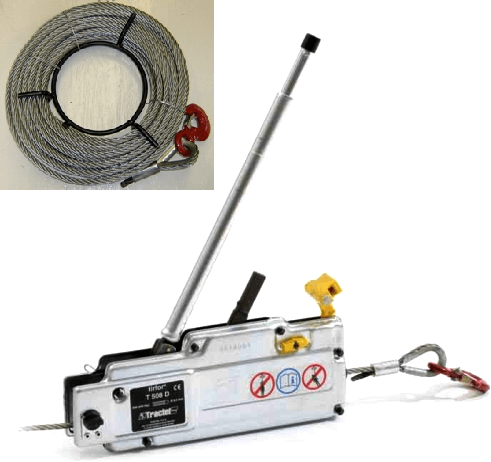 The Tirfor should be securely fitted to an appropriate anchor point with the use of a suitable lifting sling; you must never use the machine's own wire rope by wrapping it around the load and hooking it back onto itself. 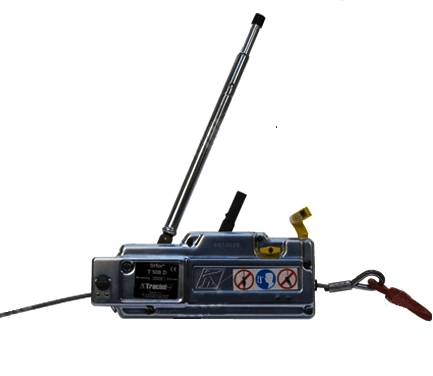 The 500 series incorporates a removable anchor pin which is used to attach the machine, it is possible to fit an optional hook to this pin for easier anchoring. Firstly you must open up the spring clip which secures the pin in place, and remove it; then you can slide out the pin from the side casings in order to attach the sling (or recommended hook); The anchor pin can then be re-inserted into the side casing and re-insert the spring clip and close it up to ensure the anchor pin will not be at risk from falling out. 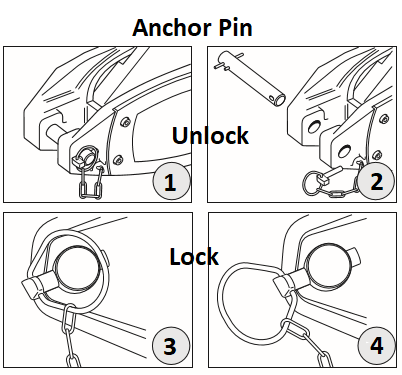 The anchor pin, spring clip and sling arrangement should be inspected prior to each use to ensure they are correctly secured. 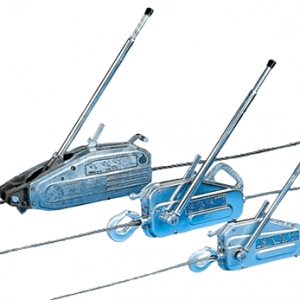 The Tirfor 500 series of cable pullers possess a rope release mechanism which enables the wire rope to be passed through in any direction, unhindered. 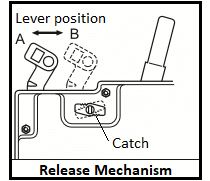 The mechanism requires two hands to operate; this ensures that the rope cannot be released accidentally; to operate the release mechanism simply turn the release catch (5) and push the release lever (4) until it locks in place, then release the catch. 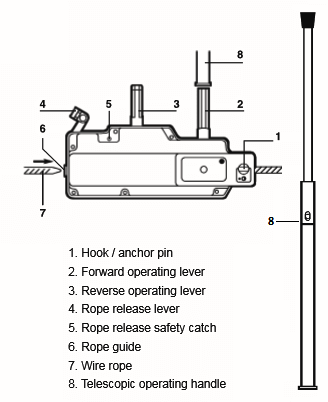 To re-engage the jaws; once again turn the safety catch (5) then press the rope release lever downwards, vertically, this allows the lever to go back to its original position under effects of the spring; now release the safety catch and you are ready to go. 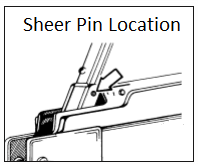 Each Tirfor 500 model incorporates sheer pins as an overload safety device, if they sheer off they can be replaced with the spare cotter pins which are located on board (see image for location), old, sheered pins should be knocked out with a suitable punch and the new pins tapped into place with a hammer. Remember to always replace the used spares with the specific, manufacturers replacements.